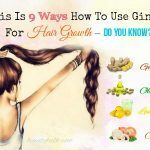 Having a shiny, smooth, straight hair is a dream of every woman in the world and a puffy, frizzy hair is a common problem that we want to get rid of. 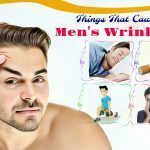 There are many different reasons for this hair problem, such as stepping out in the rain, sleeping on it wrong, using wrong shampoos and conditioners, etc. 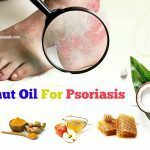 Luckily, there are a few simple ways on how to get rid of puffy hair naturally after shower that are listed in this post. 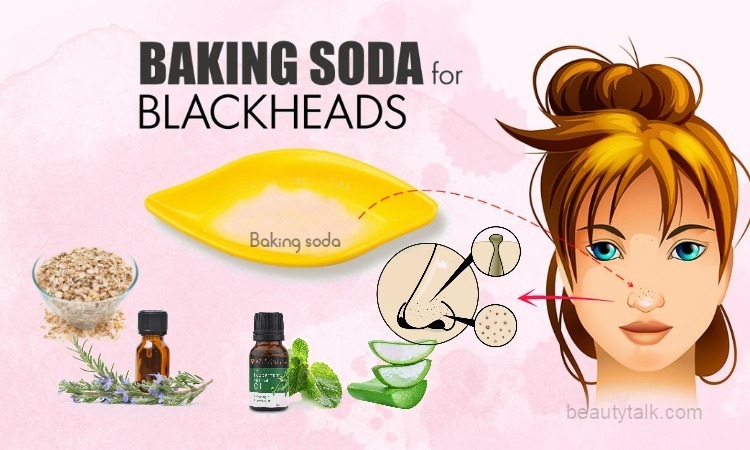 Learn these tips on Beauty Talk site to instantly reduce puffy hair for a long time. Using bristle brushes regularly can cause some serious damage and breakage, but using boar bristle brushes is really useful in distributing the hair’s oils for a silky, smooth hair. Brushing your hair with boar bristle brush before showering aids in lifting the oils away from the scalp; hence, you can get a deeper clean and allow the oils to nourish your hair in the process. 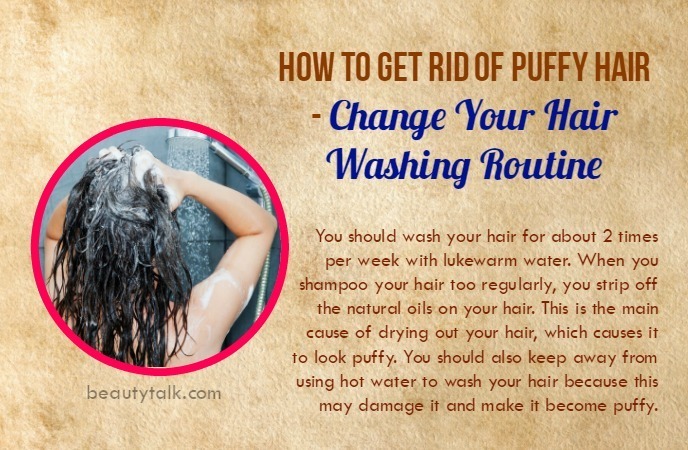 So, don’t skip this tip if you are looking for how to get rid of puffy hair naturally after shower. Try to look for a type of shampoo and conditioner that is made for dry or curly hair. Find the labels that say: moisturizing, hydrating, smoothing, or dry & damaged. When you use conditioner, leave it on your hair for about 2 to 3 minutes, which will let your hair absorb the nutrients present in the conditioner. In addition, you should also consider using a conditioner infused with protein. This type of deep conditioner will aid in repairing a dry, damaged hair. It can also protect the hair against humidity, which may cause a puffy hair. Another useful way on how to get rid of puffy hair naturally after shower is to use a scarf or hat. This will not only help to disguise your puffy hair but also keep your hair from the damage caused by the sun, heat, wind, and cold. In fact, a damaged hair always looks puffy or frizzy. You should wash your hair for about 2 times per week with lukewarm water. When you shampoo your hair too regularly, you strip off the natural oils on your hair. This is the main cause of drying out your hair, which causes it to look puffy. You should also keep away from using hot water to wash your hair because this may damage it and make it become puffy. In case, you notice your hair roots getting too greasy, try shaking a baby powder or dry shampoo on your scalp. Allow it to sit on for 5 minutes and then run your fingers through the hair to distribute the white powders. 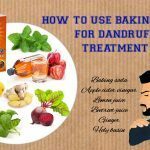 In the list of useful ways on how to get rid of puffy hair naturally after shower will be incomplete without including this tip. Simply, use the very soft towel or your old t-shirt to wrap your hair gently, and squeeze it out so that the fabric may soak up the excess water. Or you can also wrap your hair with this towel in a loose turban. Remember to avoid using a towel to rub your hair. The fibers of towels will snag your hair strands and then damage it. Divide your hair into small sections and comb it, starting from the hair ends first and then combing towards the hair roots. Remember not to comb the hair straight down because this can cause the hair strands to stretch & snap. You should do this while your hair is damp and covered in a great conditioner. The conditioner will help to lubricate the comb and glide between the hair strands easier. If you want to detangle your hair when it is still dry, avoid using a brush. You should use a wide-toothed comb or your fingers. Using a hairbrush to brush a dry hair can result in a frizzy and puffy hair. In case, you must use the hairbrush, remember to use one with soft, natural bristles to avoid snagging your hair. In addition, the natural bristled brush also polishes your hair and makes the hair ends smoother. 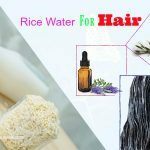 This is considered as an excellent way to add the texture to your hair but keep it natural. Simply, you just apply it right after washing your hair, starting at your hair tips and then going towards your hair roots. Styling creams or mousse aid in holding the natural shape of your hair. 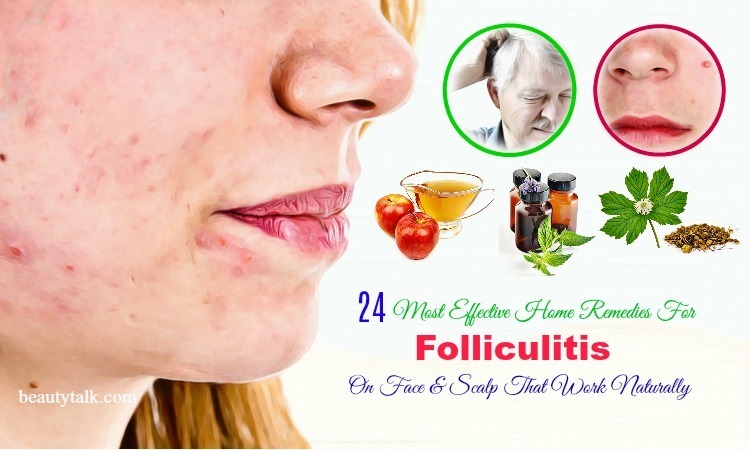 In fact, this is known as the most natural and simplest way on how to get rid of puffy hair naturally after shower. Moreover, it also will not disrupt the natural shape of your hair because your hair will become puffy when you disrupt its pattern. In case, you must use a blow dryer, make sure to apply a heat protecting spray to your hair and remember to use a medium or even low heat setting. In fact, curling irons and flat irons can damage any hair type. So, try to use these styling tools only for special occasions. While you must use a curling iron or a flat iron, remember to spray your hair with a good heat protecting spray. Make sure to use your tools in a lower heat setting; although it can take longer to reach the style you want, it will become gentler on your hair. 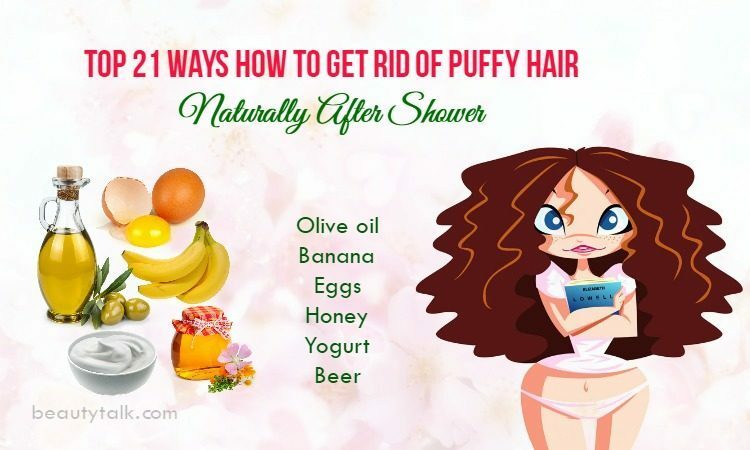 This is also listed in the best ways on how to get rid of puffy hair naturally after shower. Although touching or playing with the hair can be tempting, particularly when you have a curly hair, this is not good for your hair. In fact, the more you touch or play with your hair when it's dry, the more you mess up the hair strands and cuticles. This will cause your hair to puff and frizz. Parabens have been related to cancer, which you would want to put into the hair. Silicones that are not only great at making your hair look smooth and shiny are only eliminated by sulfates. And sulfates are harsh, cleaning ingredients found in household detergents; they may strip off the natural oils from your hair, leaving it dry and brittle. You should not leave these silicones in your hair because this can result in the buildup, which makes your hair appear dull and limp. 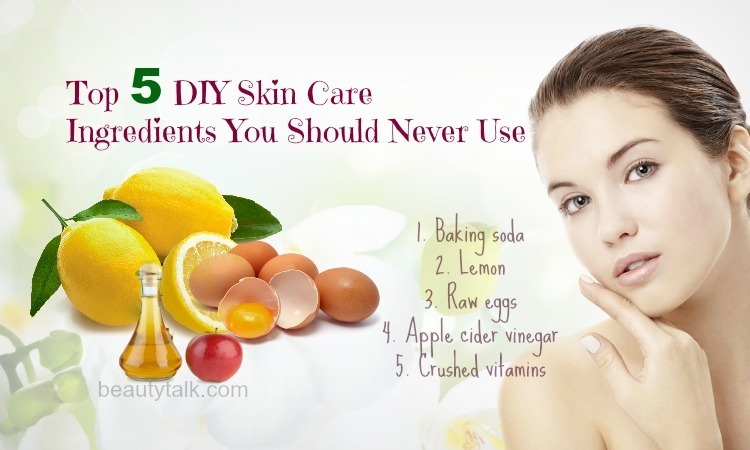 You should also keep away from products that have alcohol. Alcohol causes your hair to become very dry. Dry hair has a tendency to get puffy. Using oil to massage is an excellent way to condition a puffy hair deeply. 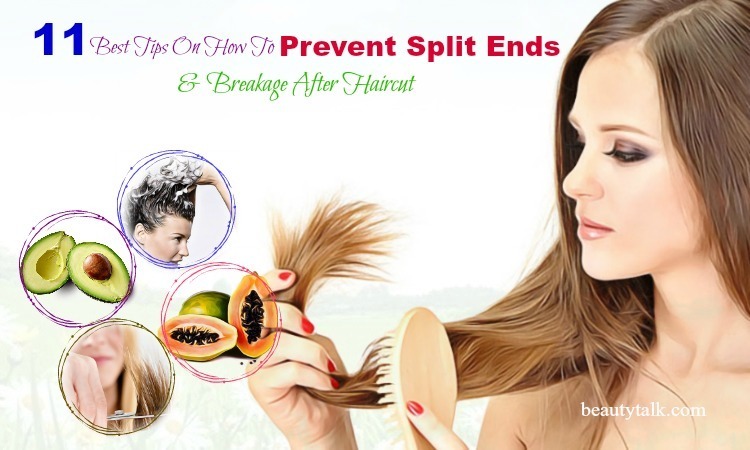 It may repair a damaged hair and make it look smoother. When it comes to hot oil treatments, olive oil is one of the most recommended, but you may also use almond oil or coconut oil with great benefits. Your hair will become smoother and very easy to style. 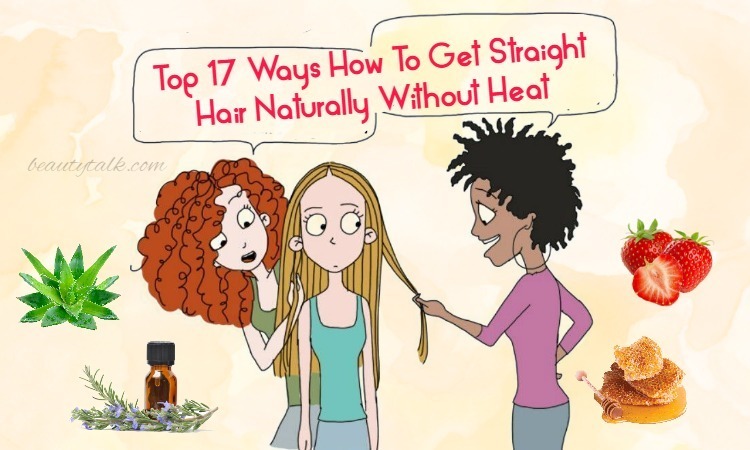 You can use hot oil treatments for once or twice per month to get rid of dry dull puffy hair. Note: Avoid leaving hot oil unattended. Let hot oil cool down to a suitable temperature to stay away from scalding. The most useful of all methods on how to get rid of puffy hair naturally after shower is to use a mask made with avocado & olive oil because they have great hydrating benefits. Olive oil helps to soften puff and split ends, which will leave your hair shiny and smooth while avocado has biotin, a vitamin that will make your hair stronger. Coconut oil and Moroccan oil make the best treatment for a puffy hair that you should try. 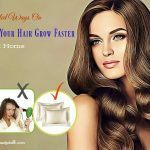 It is an excellent way to keep puffy hair manageable, smooth, and well-conditioned. Moroccan or Argan oil maintains your hair luster smoothness & controls puff. On the other hand, coconut oil reduces the loss of protein to repair a puffy hair & split ends. Mix oil with your shampoo and conditioner in equal parts in order to make a homemade shampoo and conditioner. Bananas are very useful for your hair thanks to their moisturizing properties. This great fruit to create DIY hair care gives the hair a natural shine & luster. Using a hair mask with bananas can help you to tame a dull puffy straight hair. Banana masks are effective and will provide you with an instant feel of silky hair that looks lustrous & shiny. Bananas also keep your hair healthy and hydrated. Mayonnaise hair treatment can be used as the best way on how to get rid of puffy hair naturally due to humidity. It contains moisturizing properties and will aid in restoring puffy hair. This treatment locks the moisture in the hair and softens a brittle puffy hair. 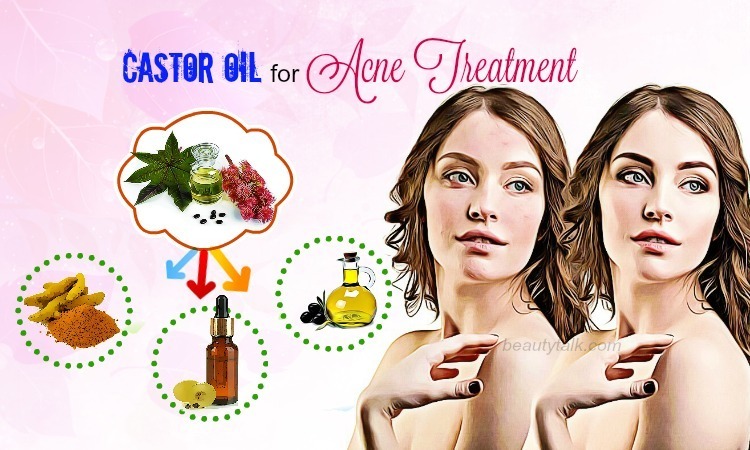 Or, you can also add 1 egg yolk, 1 tablespoon of olive oil, and 1 tablespoon of lime juice to this treatment for more benefits. 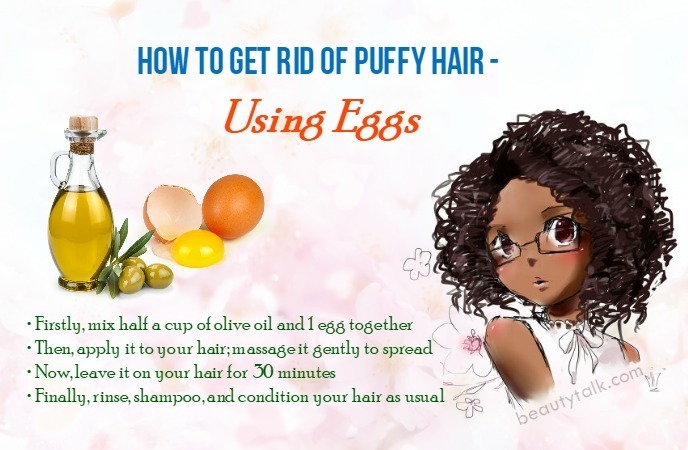 Eggs are rich in protein and one of the popular ways on how to get rid of puffy hair naturally. Eggs have healthy fats and can be used with olive oil that works as an emollient to lock in the moisture. Carbonated water is very useful in getting rid of puff caused due to humidity. Carbonated water aids in reducing puff thanks to its low PH level that will make the cuticle layers lay flat. This will help to prevent the loss of moisture and give your hair a smooth look. After rinsing your hair, wash it with carbonated water as a final rinse. Honey is known as a great natural humectant; hence, it can attract and keep molecules of water, which will keep your hair moist and very easy to manage. You can also rinse your hair with honey whenever you shampoo your hair in order to nourish it and remove the dryness. Finally, condition and style it as usual. Beer is another hair rinse that combats puff effectively. Beer helps to replenish the moisture and nourishes the hair with many essential minerals, nutrients, and antioxidants. You should use the dark beer for better results. Or, you can mix beer with shampoo & conditioner in equal parts to create a homemade shampoo & conditioner respectively. Yogurt contains lactic acid that helps to cleanse your hair, removing dandruff and curing an itchy scalp. In addition, it also contains cooling properties. Yogurt keeps a dry dull hair moist and gets rid of puff, which will allow you to manage and style your hair easier. 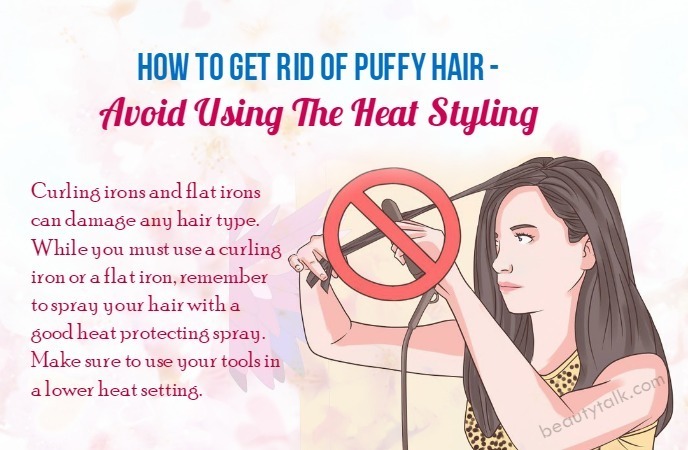 To sum up, to get rid of a puffy hair and get a smooth, shiny hair, follow our simple and useful tips. In addition, if you know other ways on how to get rid of puffy hair naturally after shower, please share with us. You can also have a look our main Hair Care to find more other useful articles.